The G20 has made steady progress on business goals since 2011, according to the latest G20 Business Scorecard, published today by the International Chamber of Commerce (ICC). The third instalment of the annual Scorecard reveals a year-on-year improvement in score since ICC’s monitoring began, while still noting that progress remains poor in several crucial areas, including energy and the environment. 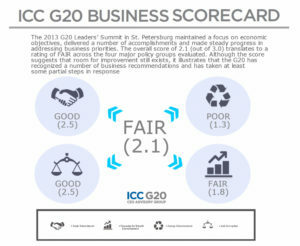 Overall, the Scorecard rates G20 responsiveness to business priorities as ‘fair’, reflecting a score of 2.1 out of a possible 3.0, higher than the two earlier Scorecards. Among the positive outcomes that led to this year’s higher score was the G20 support for the historic World Trade Organization Agreement on Trade Facilitation and the extension of the G20 standstill on protectionist measures until the end of 2016. The improvement in score also reflected G20 efforts to increase access to finance for small and medium businesses and the recognition of business as a key partner in the fight against corruption. But the positive overall trend also masked deficiencies in individual categories. Among the lows was the failure to recognize the importance of information and communication technologies (ICTs), no movement on carbon pricing and a lack of discussions on a high-standard multilateral framework for international investment. The Scorecard – which rates the overall responses by G20 nations to key business goals during the 2013 Russian Presidency – measures progress on business priorities on a scale of: ‘inadequate’, ‘poor’, ‘fair’ or ‘good’. The Scorecardlooks at the G20’s collective response to business goals only and does not rate individual countries or the G20’s entire agenda. Four areas are assessed: Trade and Investment; Financing for Growth and Development; Energy and Environment; and Anti-Corruption. A fifth chapter, Job Creation and Human Capital, was prepared in partnership with the International Organization of Employers (IOE) and the Business and Industry Advisory Committee to the OECD (BIAC). This chapter examines the steps taken by the G20 to address global unemployment but does not rate its progress at this stage. Decisions and action on trade and investment are rated as “Good”, a significant improvement over last year’s rating of “Poor”. Highlights include St. Petersburg’s backing of multilateral trade, a deal to extend the freeze on new protectionist measures until 2016, and discussions on enhancing regional trade agreements compatibility with the multilateral trading system. Notably, the exercised leadership of the G20 ultimately led to consensus on the WTO Agreement on Trade Facilitation – one that will not only restore confidence in the multilateral trading system but will also generate a much needed stimulus of US$1 trillion and 21 million jobs to the world economy. On the other hand, Financing for Growth and Development dropped from “Good” last year to “Fair”. The Scorecard reported that although G20 leaders have expressed the need to promote innovation and find new solutions to growing problems such as food security, development and financial inclusion, there has not yet been any official recognition by the G20 of the role that information and communication technologies could play in achieving these solutions. Even more surprising is that there has not been a single mention of the Internet in any of the eight Leaders’ Summit Declarations since 2008. “In the bigger picture, business was pleased with the G20’s ambitious financial inclusion agenda and we are encouraged by the increased recognition of the importance of infrastructure project preparation and development,” said ICC Secretary General Jean-Guy Carrier. The weakest area was Energy and the Environment, where G20 commitments and decisions were rated “Poor”, down from last year’s “Fair”. Business had asked for laws, incentives and policies that would give clarity for long-term energy investments and the shift to a greener economy, the Scorecardsays, but the G20 had not acted to lift barriers to trade in green goods and services, or to achieve market-based carbon pricing. The Scorecard noted that progress on the 2009 G20 commitment to rationalize and phase out inefficient fossil fuel subsidies had been too slow, but welcomed the creation of a peer review process. But responses to the need for Anti-Corruption measures had improved to “Good”. This is important because the extra cost of corruption is like an extra tax and bribery undermines market competition. With regard to Job Creation and Human Capital, the Scorecard noted the lack of employment targets or measurable progress by the G20, despite business having called for more flexible work practices and attention to workers’ skills deficits. ICC has been deeply engaged in the G20-B20 process since the Seoul G20 Summit in 2010, and is recognized by national leaders as an important partner in the push for world growth and job creation. The business recommendations whose progress is rated in the Scorecard are mainly those that have been prioritized over time in the annual B20 reports.